Spain is one of the most important nations of the European Union (EUFOR) and Eurocorps. It also occupies a prominent position in the structure of the North Atlantic Treaty Organization (NATO), which it joined in 1982. It also has the oldest Marine Corps in the world and the oldest permanent military units in the world: the King's Immemorial Infantry Regiment No. 1 and the "Soria" Light Infantry Regiment No. 9. During the 15th and 16th century, Spain evolved into Europe's foremost power with the voyages of Christopher Columbus leading to Spain acquiring vast lands in the Americas. During the reign of Charles V and Philip II, Spain reached the peak of its power with the Spanish Empire spanning 19.4 million square km of the earth's surface, a total of 13%. By the mid 17th century this power had been weakened by the Thirty Years War along with financial problems, and the lack of reforms. During the 18th century the new Bourbon dynasty revived Spain's economic and military power through a series of important reforms in the armed forces and the economy, notably those of Charles III of Spain. Thanks to these reforms, Spain performed well during the war of Jenkins' Ear, the war of Austrian Succession but with mixed result during the Seven Years' War. Spain had recovered considerably by the outbreak of the French Revolution. The occupation of a great part of Spain by the French during the Napoleonic Wars resulted in the so-called war of Spanish independence, which was characterised by use on a large scale of guerrilla troops, made necessary by the war's devastating effect on the Spanish economy. Following the war, the Spanish military was in poor condition and political instability resulted in the loss of most of Spain's former colonies, except Cuba, Puerto Rico, and the Philippines. These too would be lost later in the Spanish–American War. Spain participated along with France, the United Kingdom, Italy, Denmark, the United States and Canada in the offensive against Moammar Gaddafi in Libya, contributing a tanker, 4 F-18 fighter jets, a frigate, a submarine and a surveillance aircraft, along with logistical support from the Naval Base of Rota and the Air Base of Morón. Spain has belonged to NATO since 1982. The decision was ratified in a referendum in 1986 by the Spanish people. The conditions were the reduction of American military bases, no integration of Spain in the military structure of NATO, and the prohibition of introducing nuclear weapons in Spain. As of June 2017, 3,093 soldiers of the Spanish Armed Forces and the Civil Guard are part of the nineteen operations where Spain has an active role. EUTM Mali (2013–present): Advisory mission in the security and training sector of the Malian National Army. 130 deployed military personnel. EUTM CAR (2016–present): Training mission of the Armed Forces of the Government of the Central African Republic. The Eurocorps is in charge of carrying out this mission. 19 military deployed. EUTM SOMALIA (2010–present): Training mission of the Somali Armed Forces, with the cooperation of the UN and the African Union. 16 military deployed. Operation Atalanta (2008–present): Mission to combat piracy in the Indian Ocean as well as protection of the UN food program. 338 deployed military. EUFOR ALTHEA BOSNIA (2004–present): Advisory mission to the Armed Forces of Bosnia and Herzegovina. 3 military deployed. EUNAVFOR MED-SOPHIA (2015–present): Mission to combat trafficking in human beings and prevention of loss of life in the Mediterranean. 261 deployed military personnel. Operation Sea Guardian (2016–present): Mission to fight against terrorism in the Mediterranean. 119 military deployed. SNMG1 / SNMG2 / SNMCMG2: NATO first-responder permanent naval units. 251 deployed military personnel. Baltic Air Policing (2004–present): Mission to protect the airspace of Estonia, Latvia and Lithuania. 128 deployed military personnel. Enhanced Forward Presence (2017–present): Mission of presence of NATO in the Baltic Sea region following the annexation of Crimea by Russia. 310 military deployed. Operation Active Fence (2015–present): Mission to reinforce Turkey's air defense against the threat of ballistic missiles from Syria. 149 deployed military personnel. RESOLUTE SUPPORT (2015–present): Training and advisory mission of the Afghan security forces. 19 military deployed. UNIFIL (2006–present): Peacekeeping Monitoring Mission between Lebanon and Israel. 620 soldiers and civil guards deployed. UN COLOMBIA (2016–present): Mission of observers of the peace process in Colombia. 14 deployed military personnel. INHERENT RESOLVE (2015–present): Training mission of Iraqi forces to fight the Daesh. 463 soldiers and civil guards deployed. Support for Mali-Senegal (2013–present): Military support to France to facilitate air transport of French and EU operations in Mali and Sahel. 61 military deployed. Support for the Central African Republic (2013–present): Military support for France and the EU to facilitate air transport in its operations. 45 military deployed. Support for Senegal (2016–present): Cooperative security activities with other countries. 34 deployed military personnel. Support for Cape Verde (2016–present): Cooperative security activities with other countries. 59 deployed military personnel. The Spanish Armed Forces also participated in the last few years in other missions, above all humanitarian and observation: in Albania in 1999, Mozambique in 2000, Republic of Macedonia in 2001, Haiti in 2004 and Indonesia in 2005. In 2006, Spain participated in Darfur (Sudan) by sending observers, and in the Democratic Republic of the Congo. Spain also participated in the Iraq War between 2003 and 2004, in Gabon and in Senegal to ensurence the maritim traffic in the Horn of Africa (in this one, with 33 civil guards and national police officers, two patrol vessels and a helicopter). Furthermore, in 2015, 46 UME soldiers and 12 civil guards of the High Mountain Group went to help and rescue in the Nepal earthquake, along with six dogs, three scientific police and a Boeing 707 of supplies transport of the Air Force. The cost of these missions abroad amounts to approximately 800 million euros per year. The commander in chief of the Armed Forces is the King of Spain; with the ex officio rank of Capitán General in the Army, Navy and Air Force. The Spanish Constitution of 1978 states in article 62(h) that the King of Spain shall have "supreme command of the Armed Forces"; however under article 64, all official acts of the King must be countersigned by the President of the Government (or other competent minister) to become valid. The President of the Government (also known as Prime Minister in English translations), as the head of government, is responsible under article 97 for "domestic and foreign policy, civil and military administration and the defence of the State", and thus bears the ultimate responsibility before the Cortes Generales, and the Spanish electorate. The Minister of Defence, a member of the Government, is in charge of running the Ministry of Defence which carries out the day-to-day administration of the forces. The President of the Government and the Minister of Defence are civilians. No provision in the Constitution requires the Government to seek approval from the Cortes Generales before sending the armed forces abroad. The Chief of the Defense Staff is the Spanish equivalent of a chief of defence, directs the Defense Staff and is the senior military advisor to the Minister and the Government. The military leadership of the three military services are: the Chief of Staff of the Army, the Chief of Staff of the Air Force and the Chief of Staff of the Navy. Commander in chief: Capitán General of the Armed Forces H.M. The King of Spain, Felipe VI. President of the Government: The Most Excellent President Pedro Sánchez. Minister of Defence: The Most Excellent Madam Minister Margarita Robles. Chief of the Defence Staff: The Most Excellent Army General Fernando Alejandre Martínez. Chief of Staff of the Army: The Most Excellent Army General Francisco Javier Varela Salas. Chief of Staff of the Navy: The Most Excellent General admiral Teodoro E. López Calderón. Chief of Staff of the Air Force: The Most Excellent Air General Javier Salto Martínez-Avial. The Spanish armed forces are a professional force with a strength in 2017 of 121,900 active personnel and 4,770 reserve personnel. The country also has the 77,000 strong Civil Guard which comes under the control of the Ministry of Defence in times of a national emergency. The Spanish defence budget is 5.71 billion euros (7.2 billion USD) a 1% increase for 2015. The increase comes because of security concerns in the country. The Spanish army consists of 15 active brigades and 6 military regions. Modern infantry have diverse capabilities and this is reflected in the varied roles assigned to them. There are four operational roles that infantry battalions can fulfil: air assault, armoured infantry, mechanised infantry, and light role infantry. The Spanish army has the latest technology at its disposal to preserve the territorial integrity of the Kingdom of Spain. Canary Islands Maritime Zone with its headquarters at Las Palmas de Gran Canaria. The current flagship of the Spanish Navy is the amphibious assault ship Juan Carlos 1 which is also used as an aircraft carrier. In addition, the fleet consists of: 2 amphibious transport docks, 11 frigates, 3 submarines, 6 mine countermeasure vessels, 23 patrol vessels and a number of auxiliary ships. The total displacement of the Spanish Navy is approximately 220,000 tonnes. As of 2012, the Armada has a strength of 20,838 personnel. The Marines, in Spanish, Infanteria de Marina, are the marine infantry of the Spanish Navy, the oldest in the world. It has a strength of 5,000 troops divided into base defense forces and landing forces. One of the three base defense battalions is stationed with each of the Navy headquarters. "Groups" (midway between battalions and regiments) are stationed in Madrid and Las Palmas de Gran Canaria. The Tercio (fleet — regiment equivalent) is available for immediate embarkation and based out of San Fernando. Its principal weapons include light tanks, armored personnel vehicles, self-propelled artillery, and TOW and Dragon antitank missiles. Spain currently has 10 fighter squadrons, each with 18-24 airplanes. The air force also has 15 operational air bases around the country. The air force operates a wide-ranging fleet of aircraft, from fighters to transport aircraft and passenger transports to helicopters. It maintains some 450 aircraft in total, of which around 130 are fighter aircraft, including a number of Eurofighter Typhoons. The Spanish Air Force is replacing older aircraft in the inventory with newer ones including the recently introduced Eurofighter Typhoon and the Airbus A400M Atlas airlifter. Both are manufactured with Spanish participation; EADS CASA makes the Eurofighter's right wing and leading edge slats, and participates in the testing and assembly of the airlifter. Its aerobatic display team is the Patrulla Aguila, which flies the CASA C-101 Aviojet.Its helicopter display team, Patrulla Aspa, flies the Eurocopter EC-120 Colibrí. In July 2014 the Spanish Air Force joined the European Air Transport Command, headquartered at Eindhoven Airbase in the Netherlands. 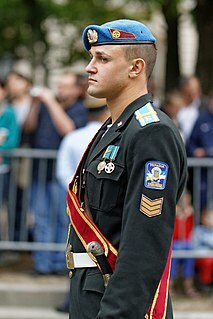 The Royal Guard (Guardia Real) is an independent unit of the Spanish Armed Forces whose primary task is the military protection of the King of Spain and the Spanish Royal Family. It also protects visiting Heads of State. The Royal Guard's history dates back to medieval times, the Corps of Gentlemen of the Chamber, the "Monteros de Espinosa", dating to 1006. It currently has a strength of 1,900 troops, constituting a fully functional combat unit drawn from the ranks of all three branches of the Spanish Armed Forces: among others, a Marines company, a Paratroop company and an infantry company. Some units have served recently in Afghanistan and Bosnia. The Military Emergencies Unit (Spanish: Unidad Militar de Emergencias, is the most recently instituted branch of the Spanish Armed Forces, resulting from a decision of the Council of Ministers of Spain in 2005. In addition to headquarters staff (Unidad de Cuartel General, there are five emergency intervention battalions (Batallon de Intervención en Emergencias, BIEM), a support regiment (Regimiento de Apoyo a Emergencias) and an aerial group (Agrupación de Medios Aéreos). It is responsible for providing disaster relief principally throughout Spain but also if necessary abroad. The activities including handling natural hazards such as floods and earthquakes, forest fires, chemical and nuclear accidents, and other emergency situations recognized as such by the Prime Minister of Spain. ^ (in Spanish) New head of the Joint Chiefs of Spanish Defense Staff, General of the Army Fernando Alejandre Martínez. The Spanish Official Gazette Archived 2017-08-13 at the Wayback Machine. ^ "Administrative Resolution of the Directorate-General for Personnel of the Ministry of Defence" (PDF) (in Spanish). Archived (PDF) from the original on 2017-06-19. ^ "España tiene un déficit de casi 30.000 policías y guardias civiles". abc (in Spanish). Archived from the original on 2018-12-01. Retrieved 2018-12-01. ^ Ing, David (4 April 2018). "Spanish defence budget presented to parliament". www.janes.com. Madrid: IHS Jane's. Archived from the original on 29 August 2018. Retrieved 29 August 2018. ^ a b "Fuerzas Armadas españolas en misiones internacionales, Junio 2017". 2017. Archived from the original on June 17, 2017. Retrieved June 19, 2017. ^ "Misiones en curso". April 9, 2017. Archived from the original on April 14, 2015. ^ "Medio centenar de militares españoles parten desde Jaca rumbo a Nepal". May 5, 2015. Archived from the original on October 28, 2017. Retrieved June 19, 2017. ^ Press, Europa (20 December 2016). "España gastó en 2016 más de 770 millones de euros en las misiones de las Fuerzas Armadas". Archived from the original on 8 June 2017. Retrieved 19 June 2017. ^ "Update: Spain to increase defence spending". janes.com. Archived from the original on 18 May 2015. Retrieved 8 May 2015. ^ "Military Budget 2012" (PDF). defensa.gov.es (in Spanish). p. 454. Archived (PDF) from the original on 2013-01-25. Retrieved 2013-02-12. ^ "Spain is now member of the EATC - Articles - EATC - European Air Transport Command". eatc-mil.com. Archived from the original on 7 July 2014. Retrieved 8 May 2015. The Pakistan Armed Forces are the military forces of Pakistan. They are the sixth largest in the world in terms of active military personnel and the largest among Muslim countries. The armed forces comprise three main service branches – Army, Navy, and Air Force – together with a number of paramilitary forces and the Strategic Plans Division Force. Chain of command of the military is organised under the Chairman of Joint Chiefs of Staff Committee (JCSC) alongside chiefs of staff of the army, navy, and air force. All of the branches work together during operations and joint missions under the Joint Staff Headquarters. The Turkish Armed Forces are the military forces of the Republic of Turkey. They consist of the Army, the Navy and the Air Force. The Gendarmerie and the Coast Guard, both of which have law enforcement and military functions, operate as components of the internal security forces in peacetime, and are subordinate to the Ministry of Interior. In wartime, they are subordinate to the Army and Navy. The President of Turkey is the military's overall head. The Portuguese Armed Forces are the military of Portugal. They include the General Staff of the Armed Forces, the other unified bodies and the three service branches: Portuguese Navy, Portuguese Army and Portuguese Air Force. 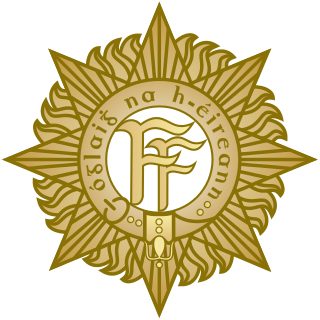 The Irish Army, known simply as the Army, is the land component of the Defence Forces of Ireland. As of May 2016, approximately 7,300 men and women serve in the Irish Army on a permanent basis and 1,600 active Reservists, divided into two geographically organised brigades. As well as maintaining its primary roles of defending the State and internal security within the State, since 1958 the Army has had a continuous presence in peacekeeping missions around the world. The Army also participates in the European Union Battlegroups. The Air Corps and Naval Service support the Army in carrying out its roles. The Defence Forces, are the military of Ireland. They encompass the Army, Air Corps, Naval Service and Reserve Defence Forces. The Caracas 5th of July military parade is the national civil-military parade that serves as the major highlight of Independence Day celebrations in Venezuela. It is celebrated in the national capital, Caracas, on July 5. The parade, an annual tradition that began in 1953, is held in the capital's Fort Tiuna district, which serves as the headquarters of the National Bolivarian Armed Forces and houses the offices of the Ministry of Defence. The parade is one of the largest in the Americas. The parade's guest of honour is the President in his/her constitutional duty as Commander in Chief of the National Bolivarian Armed Forces, and many state officials attend the event which is broadcast live on Venezolana de Televisión and simulcast on all private and public television stations.